Before starting with the configuration let us understand some basics on iSCSI. Starting with the abbreviation iSCSI stands for Internet Small Computer System Interface which is a block level protocol for sharing your storage devices over an IP network. iSCSI can be used to transmit data over local area networks (LANs), wide area networks (WANs), or the Internet, and can enable location-independent data storage and retrieval. 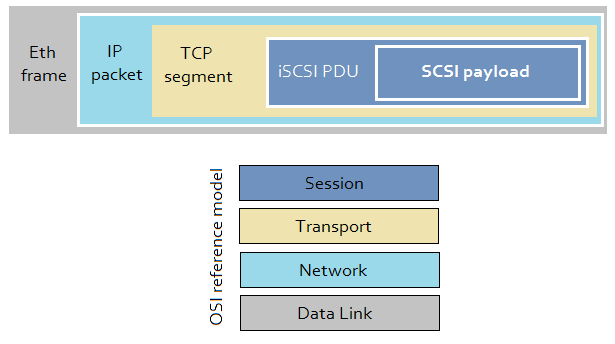 How is the iSCSI data transfer secure over network? This question can be arised since the data is getting transferred over IP network there might be a probability the this data can be compromised so to overcome this data in iSCSI is encapsulated at several layers of OS layer. SCSI payload consists of read write data that gets sent to and from disks. When it arrives at the other side of the network at the destination each of its layer is then ripped of one by one untill we are left with our original scsi payload. iSCSI Initiator is considered as the client and iSCSI traget as the server. There can be multiple targets available and owns the storage. The storage is divided into multiple LUNs(Logical Unit Number) and is mapped into iSCSI target which then is used by the client using iscsi initiator. I have added a new hard disk to my virtual machine on which I will create a new logical volume. Here backing-store <path> defines a logical unit (LUN) exported by the target. This may specify either a regular file, or a block device. As you see two LUNs are visible when we had created only one. If you see nicely LUN 0 is a controller LUn that acts as an interface to the controller. LUN 1 is the disk type with the LVM which we just created. Login to [iface: default, target: iqn.2014-09.com.example:target1, portal: 192.168.1.11,3260] successful. As you see we have sucessfully logged in as we hadn't configured any sort of CHAP authentication so it didn't prompted for any user authentication details. So as you see a new block device sdb has been added to the system.